Lynnville-Sully art teacher Tara Conover has challenged her 10 advanced art students to document their daily lives through photographs every day during the 2017-18 school year with the new Photography Project 180. According to Conover, students can take the photos using a fancy camera or simply using their phone – there is no right or wrong way to document the daily, sometimes mundane, elements of every day life. The new project developed because Conover wanted to expose the students to a new kind of photography challenge. 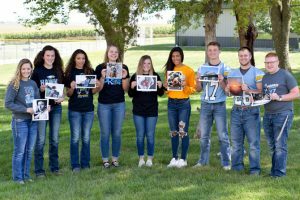 Advanced art students holding one of the 180 photos they will take over the school year are, left to right, McKinley Conover, Emily Van Gorp, Shiloh Cunningham, Kayla Van Dyke, Brittney Hansen, Jataya Meyer, Gage Vander Leest, Evan Squires, Daniel Keen, and not pictured, Andrea Bogaard. The high-end camera has the capability to send high-resolution images from the camera to students’ cell phones, allowing them to post and edit directly on their phones. Each advanced art student chose a theme to follow throughout the course of the 180-day project with themes ranging from black and white to school spirit to diary. The LSCEF grant will also provide the means for students to create posters created from the photographs. The students may print posters or mini books of their photographs or post them online using Facebook, Twitter, or Instagram. Conover encourages everyone to check out the student photography on Facebook on the Lynnville-Sully Art page. Check it out and be inspired!